Orange County Mayor Teresa Jacobs and leaders from area chambers of commerce gathered to discuss tourism, culture and the economy on Oct. 14. 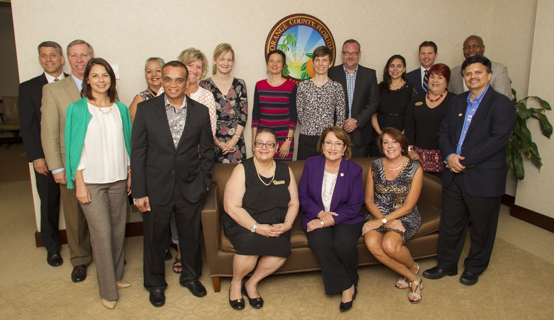 Orange County Mayor Teresa Jacobs hosted a diverse group of leaders from area chambers of commerce and economic development organizations for coffee and conversation on Oct. 14. The goal of the informal meeting was to gather local business leaders to connect and to strengthen relationships with one another. The group discussed tourism, culture, the economy and also explored local economic opportunities. Mayor Jacobs welcomed the group and highlighted the continued success of Orange County’s flourishing economy. President of the West Orange Chamber of Commerce Stina D’Uva provided an update on the Florida Association of Chamber Professionals. Chair of the Board of Directors for the Orlando Economic Development Commission (EDC) Robert Utsey presented an update on Mayor Teresa Jacobs’ regional branding campaign with the EDC, “Orlando, You don’t know the half of it.” He also outlined the organization’s merger with the Orlando Regional Chamber of Commerce – Orlando, Inc.
Jim Thomas, Executive Director of the Orlando Regional Chamber of Commerce, shared that Orlando is a finalist to become the host-city for the 2019 World Chambers Congress. Orlando is competing against Rio De Janeiro, Brazil and Bogota, Colombia for the opportunity. The World Chambers Congress is organized by the International Chamber of Commerce World Chambers Federation. Held every two years in a different region of the world, the Congress is the only international forum for chamber leaders and professionals to share best-practices, exchange ideas, develop networks, address the latest business issues affecting their communities and learn about new areas of innovation from chambers around the world. Chambers that attended the meeting include the Hispanic Chamber of Commerce Metro Orlando, West Orange Chamber of Commerce, African American Chamber of Commerce of Central Florida, Asian American Chamber of Commerce, Caribbean American Chamber of Commerce Florida, Central Florida Disability Chamber of Commerce, British American Chamber of Commerce, Orlando Regional Chamber of Commerce, Central Florida Brazilian American Chamber of Commerce, MBA Orlando, Winter Park Chamber of Commerce and the Indian American Chamber of Commerce. Representatives from the Central Florida International Trade Office and Orlando EDC also attended the meeting. A collection of photos from the chamber of commerce gathering is available on Mayor Jacobs’ Flickr album.